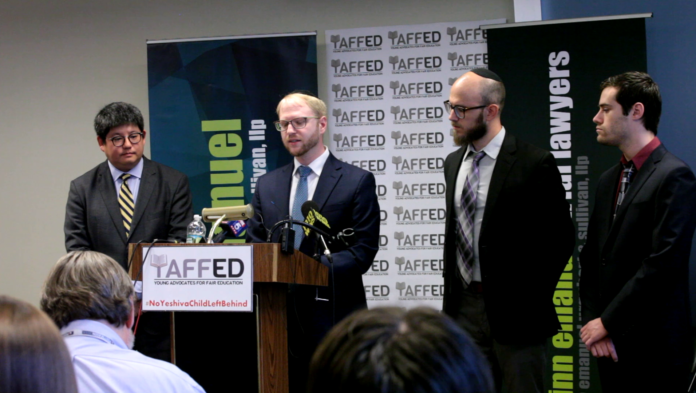 In what some are celebrating as a victory for yeshivos, a federal judge dismissed on Wednesday a lawsuit filed by YAFFED, which attempted to overturn the Felder Amendment to Education Law Section 3204. The court threw out the case because YAFFED had no standing, meaning YAFFED could not challenge the Felder Amendment because it was not legally impacted by it. The recent Felder Amendment established core math, English, science, and social studies requirements that every private school must adhere to, but allows Judaic studies to be taken into account for satisfaction of the critical thinking component. The court extensively cited the brief jointly submitted by Agudath Israel of America, PEARLS, Torah Umesorah, National Society for Hebrew Day Schools, and UJO. As the court put it, “YAFFED primarily argues that it has standing because it has spent significant effort opposing the Amendment, both in this Court and through other avenues, and thereby shifted valuable resources away from its traditional advocacy and education efforts. However, if the Court were to accept this argument, it would be difficult to conceive of a case in which an organization or individual would not have standing to challenge a statute that they find politically or socially disagreeable.” The court was also unconvinced by YAFFED’s arguments that the Felder law impacted its fundraising efforts. Agudath Israel must make clear that while this victory is welcome, it does little to help New York yeshivos now. Inspections to yeshivos for “equivalency” to public schools are scheduled to begin within weeks. These inspections are based on the authority of the New York State Education Department, not the Felder Amendment. Inspectors will be using official NYSED Guidance which mandates teaching visual arts, theater, media arts, career development, occupational studies, physical education, family science, consumer science, patriotism, tolerance, worthy uses of leisure time, and more. Subjects must be taught for a substantial number of hours per day. The penalty of noncompliance is severe. Significant questions as to how these requirements will be implemented remain. In sum, it represents a radical, and in our estimation dangerous, alteration in the relationship between government and private schools, and is unprecedented in US history. That is something to be guarded.